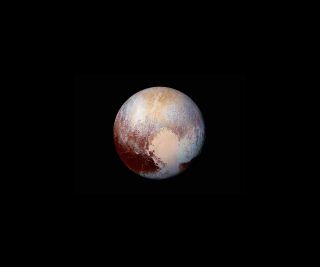 Pluto appears in color as New Horizons scientists combined four images from the spacecraft Long Range Reconnaissance Imager (LORRI) with color data from the Ralph instrument to create this enhanced color global view. The spacecraft obtained the images at a distance of 280,000 miles (450,000 kilometers). This stunning space wallpaper shows Pluto in color as New Horizons scientists combined four images from the spacecraft Long Range Reconnaissance Imager (LORRI) with color data from the Ralph instrument to create this enhanced color global view. The spacecraft obtained the images at a distance of 280,000 miles (450,000 kilometers). Read the story behind this wallpaper.